The Bishop appointed Msgr. Matthias Nyakatura as the overall overseer of all the nine committees, Rev. Fr. Robert Mugisa, who is the Diocesan Pastoral Coordinator, as the Overall Coordinator and Dr. Emmanuel Kiiza Aliba, the Executive Secretary of the Justice and Peace Department of the Uganda Episcopal Conference, as the chairperson. The committees are holding their meetings every third Friday of the month to give reports on how the preparations are on-going. Dr. Aliba says that the committees are handling the preparations of the 2017 Martyr’s celebration in the most effective and efficient way so far and everything is still on schedule. “This isn’t our first time to lead the Martyr’s day celebration. From our past experience, we did a good job and we believe we can handle this even much better,” he said in a recent meeting adding that as a Diocese we have a rough picture having sent a team of 10 people to Kiyinda-Mityana Diocese for a benchmark study on how they conducted their preparations for the 2016 celebration so as to borrow a leaf and make ourselves abreast with the most recent trend of preparation of the Martyr’s day. He further noted that the preparations and actual celebrations have been estimated to a budget of 500 million Ugandan shillings. “During our first meeting, we decided that all the work of fundraising should be done in three vicariates of the diocese which includes Hoima, Kibale and Masindi,” he explained. He added, “Our system of fundraising is going to be very simple. We have over 800,000 Catholic faithful in our diocese and we plan to ask each Christian to contribute only one thousand shillings (1000/=). To easily raise this money, a further breakdown was made whereby each Parish was levied a given amount of money to raise and contribute so as to raise the five hundred million (500,000,000/=) shillings. Also, all schools at all levels as well as institutions within Hoima Diocese were also requested to make contributions for the this cause. We believe this plan is going to work out because each vicariate will involve all their parishes.” The Diocese of Hoima last presided over the Martyrs Day celebrations in 2001. Every year on 3rd June, many Ugandan and International pilgrims throng Namugongo to commemorate the heroic faith of the 45 Martyrs Catholic and Anglican who were burnt to death on the orders of Mwanga, the then King of Buganda between 1885 and 1887. The twenty-two Catholic Martyrs were beatified on 6th June, 1920 by Pope Benedict XV. They were declared Saints on 18th October 1964 by Pope Paul VI. 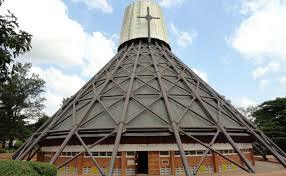 Of the 22 Martyrs who were canonized, two of them; St. Andrea Kaahwa and St. Anatoli Kirigwaijo came from Hoima Diocese. In addition to the 22 Catholic Martyrs, there are two Catechists from Paimol: Blessed Daudi Okelo and Blessed Jildo Irwa who were killed in 1918. The two Catechists were beatified by St. Pope John Paul II on October 20, 2002. The Rt. Rev. Vincent Kirabo chose “STAND FIRM IN THE FAITH: THAT WE HAVE BEEN TAUGHT” (Col 2:7) as the theme for this year’s Martyr’s day celebrations.